Monday night was full of excitement for at least one member of this household. It was about 8:30, well after dark, when I went downstairs to retrieve a box that I knew was waiting for me outside my front door. As usual, the cats followed me downstairs. As I cracked open the front door, Kismet shot past me, out to the porch, down the steps, and onto the front walkway. Now, it needs to be noted here that Kismet, almost five years old, has never been farther outdoors than the doormat since he was brought to the shelter as a week-old foundling. The great outdoors is foreign to him, something seen through windows… but containing all sorts of neat things, like birds and squirrels. As Kismet investigated the edge of my lawn — walking on grass would be a new experience for him — I was perhaps a bit, shall we say, enthusiastic in calling to him to get back into the house. I may have questioned his parentage. It was only natural, then, for Kismet to scamper off, heading onto the lawn, and around towards the back of the house. I, with my deficiencies in the walking department, was not even remotely able to keep up with him. He disappeared into the dark. I was pretty sure he was busy investigating the back yard, but there was no way I’d be able to find him, much less catch him, as dark as it was. I sat out on the front steps, calling his name, figuring that eventually he’d get tired, hungry, thirsty, lonely, or cold. It was a cold night, only a few degrees above freezing. After about an hour of calling Kismet’s name and imagining that he was on his way to becoming bear* guano**, I schlepped upstairs to get the flashlight I keep at my desk, with the thought of actively searching for the cat, rather than counting on his ability to find his way back to the front door. He may be nice, but he’s often rather dim. Suddenly, it occurred to me that since Kismet has a brain approximately the size of a walnut, I might, just might, be able to outsmart him. Along with the flashlight, I grabbed the single most lethal weapon in my feline-oriented arsenal: the laser pointer. As it happens, I had only hours before loaded it with a fresh battery. Thinking further, I realized that there is one sound that always brings Kismet running: the garage door opener. Any time I return from a trip out of the house and open the door from the garage into the house, Kismet will be poised there, waiting for a chance to go out to the garage. I learned early on that the garage door needs to be shut before I open the door into the house, because it’s a sure bet that Kismet will dash out the moment that door is opened. I went out to the garage, shutting the door to keep Packet indoors (he looked as if he had been considering the possibility of following Kismet outdoors) and hit the switch to open the garage door. It seemed like a matter of only a few seconds before Kismet made an appearance — I saw him peeking out from under my pickup truck. I brought out the laser, and as I expected, it worked its magic; I used it to lure Kismet right up to the door into the house. I quickly hit the switch to close the garage door, and that, as they say, was that. When I opened the door into the house, Kismet strolled in as if nothing had happened. 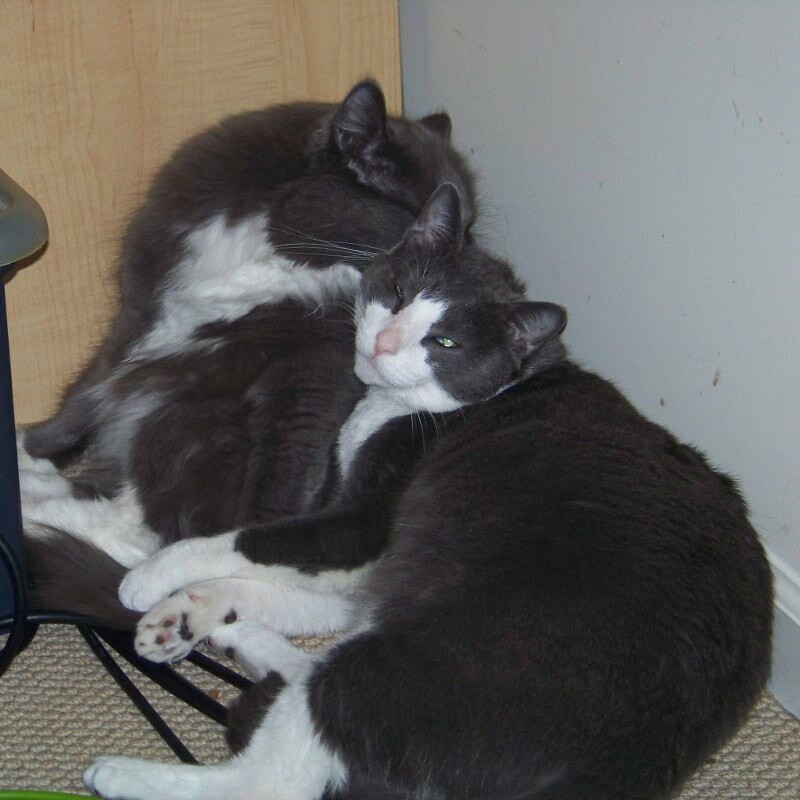 He made his way up the stairs, followed by Packet, and settled in my office, where they decided to get snuggly with each other. It seemed pretty clear to me that he’d had a great deal of fun, but equally clear that he was happy to be back among the comforts of hearth and home. The lesson from all this: make sure of the cats’ locations before opening the front door, instead of regretting it after. * It’s been several years since a bear has been seen in this area. Nevertheless, the thought persisted. ** Yes, yes, I know “guano” refers specifically to the output of bats. Call this usage “artistic license” if that will get you through the day. Glad it had a happy ending. And while it might seem a bit silly to be proud of outwitting a creature with “a brain approximately the size of a walnut,” well done, sir.You didn’t just have to out-think him, you had to think like him first.